A collection in RavenDB is a set of documents tagged with the same @collection metadata property. Every document belongs to exactly one collection. although typically, a collection holds similarly structured documents based on the entity type of the document. The collection is just a virtual concept. There is no influence on how or where documents within the same collection are physically stored. 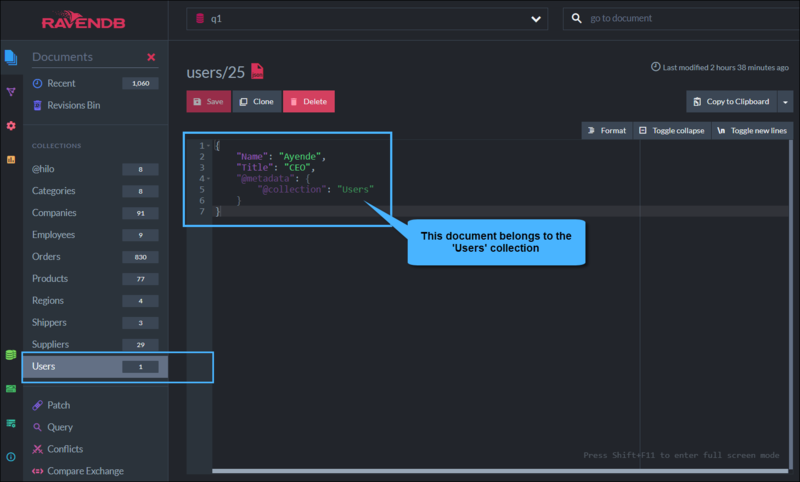 Collections are used throughout many RavenDB features, such as defining indexes, setting revisions, and much more. The document collection metadata is generated based on the stored entity object type. By default, the client pluralizes the collection name based on the type name. e.g. storing an entity of type Order will generate the collection name Orders. The function that is responsible for tagging the documents can be overridden. See: Global Identifier Generation Conventions. The collection metadata is generated based on the document ID prefix. will all belong to the same Users collection. RavenDB keeps an internal storage index per collection created. This internal index is used to query the database and retrieve only documents from a specified collection. Each Map Index is built against a single collection (or muliple collections when using a Multi-Map Index. During the indexing process, the index function iterates only over the documents that belong to the specified collection(s). Documents Revisions can be defined per collection. A RavenDB ETL Task & SQL ETL Task are defined on specified collections. The ranges of available IDs values returned by HiLo algorithm are per collection name.